The past few years, around Christmas, I’ve begun praying that God would give me a new word for the new year. For example, last year He gave me the word “abide”. I didn’t think it was the coolest word and I kept praying about it but that was the word. Abide. So I looked it up. Abide has three meanings. It can mean to accept or bear something. It can mean to stay or live somewhere. Or it can mean to remain or continue. Little did I know on the eve of 2014 that God would meet me in each of those definitions. He walked me through the accepting and bearing of difficult situations throughout the year. He answered our prayers and moved our family to Florida- the new state in which we “abide”. And He has encouraged my heart in the tasks He has given me in which I need to remain or continue. In 2014 we not only remained, we watched God start many new things in our lives. A new home in a new state. Homeschooling our “fab five”. New adventures, new organizations, new relationships. Yet, with everything “new” in 2014, He beckoned my heart to abide in Him. To make my home snuggled up in His arms. To nest under His wings. To push in so close, so deep, that I find myself lulled to sleep by the beating of His heart. That’s what it means to abide in Him. If you do not already pray for God to give you a new word each year, I encourage you to start praying now. Jeremiah 29:13 says that when we seek Him with our whole heart, we will find Him. If you want to embrace what the Lord has for you, you have to seek Him and ask Him what it is that He wants for you. Why not start by asking Him for a word that will impact your year? I love soup on a cold day. And since we’ve moved to Florida, we haven’t had many “cold” days. But “cold” is a relative term, right?! So, I tried out a new soup recipe anyway and it was a HUGE hit in my house. I just thought I’d share in case it’s cold where you are… or not. Sadly, this was the only picture I snapped of the soup before we inhaled it. Make a savory soup to warm your belly…and your heart. Heat 2 tbsp of olive oil in a large soup pot over medium heat. Add beef, stirring until browned. Drain beef and set aside. Heat remaining 2 tbsp of olive oil in the same pot and add peppers, onions, and garlic. Sautee for aproximately 3 minutes or so. Add in tomatoes, tomato sauce, broth, parsley, basil, oregano, and cooked beef. Add salt and pepper to taste. Bring to a light boil and reduce heat to low, cover and simmer, stirring occassionally for 30 minutes. As the soup simmers, prepare rice according to the directions listed on the package. When you’re ready to serve your soup, add a generous portion of rice to your bowl first. (Keeping the rice separate prevents the rice from turning to mush if you have any leftovers! And if you’re lucky- you will!) 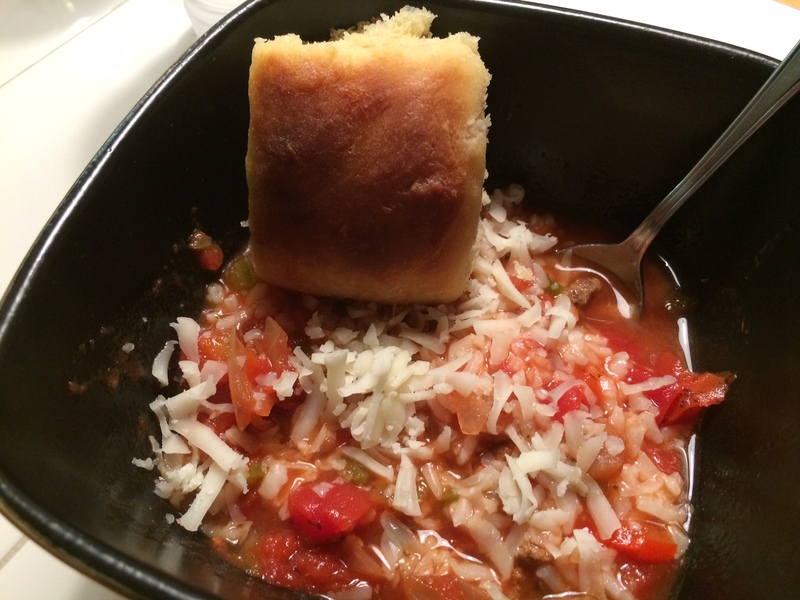 Top with shredded mozzarella cheese and enjoy! This recipe makes enough to feed an army… or at least a squad, so feel free to cut the recipe in half if you’re only feeding a small team.